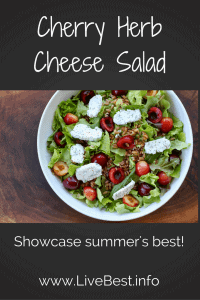 Cherry Herb Cheese Salad is summery goodness with fresh cherries, herbs and creamy goat cheese. Every bite is scrumptious and fresh in this easy salad! If you’ve been to the grocery store recently, you likely noticed cherries are front and center. A summer favorite, this is their season and they are at their best through August. The clock starts ticking once a cherry is picked. Cherry harvesters are ready to go at dawn when it’s cool because cherry picking ends when the temperature hits 82 degrees F. The fruit is between 60 and 70 degrees when picked and is water cooled within hours of picking to lower the temperature to near forty degrees. 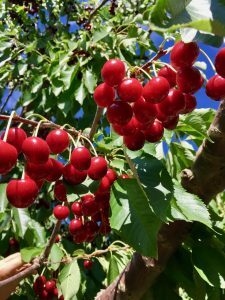 I recently learned the ins and outs of cherry farming as a guest of Chelan Fresh, a marketing arm of area growers. I met farmers and toured orchards and processing plants in central Washington. I discovered how temperamental cherries can be. Rain, wind, hail, birds and insects wreak havoc on an orchard. Rain from thunderstorms can be absorbed by the fruit, causing the skin to split. Standing in the field after a storm you can hear the pop as the skin breaks. Broken skin ruins the fruit so it can’t be sold — which means no paycheck. To avoid that helicopters are used to drive away rainwater. After a storm they hover over the orchard, drying the fragile fruit. Cherries bruise easily so the fruit is handpicked with the stem attached. The stem protects the fruit from absorbing water during processing. 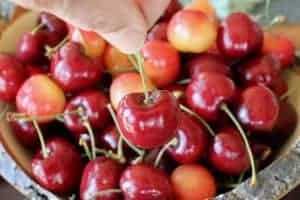 The farmers say the health of the cherry is based on the stem. A green flexible stem indicates freshness. Look for firm, shiny fruit that is free from dents and pits. Cherries like it cool and dry so refrigerate as quickly as you can. Store them in the crisper drawer in a perforated plastic bag so the naturally occurring ripening gases can escape. Rinse cherries before eating but eat them within a few days for best quality and flavor. Cherries can be frozen. 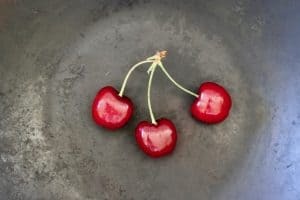 Place cherries on a baking sheet. Freeze, then transfer to an airtight container. Frozen cherries will be softer when thawed so use in sauces, jams or cooked dishes. When thawed the pits should pop out with a gentle squeeze. Cherries’ dark red color means they are rich in plant compounds that reduce inflammation and pain and improve blood cholesterol and heart health. Yellow Rainier cherries are sweet and delish, but have just one-fourth the antioxidant value of the reds. Tart cherry juice has been widely studied. Research indicates tart cherry juice speeds muscle recovery after exercise. Runners who drank a glass of juice before a race and one cup after reported significantly less pain. They also reported better sleep. That’s because cherries contain melatonin, which can aid in falling asleep faster. Sweet cherries are usually eaten fresh but they can be cooked. Sour, or “pie” cherries are not as readily available. Sours are generally too tart to eat raw so are used to in jams, pies, cobblers and other desserts. If you’re like me, your favorite way to eat cherries is one at a time. Twenty one cherries is considered a serving. Too many can have a laxative effect, but they can also help relieve constipation. 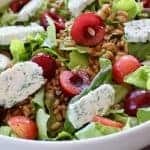 To spread the cherry love, I made this refreshing summer salad with creamy herb goat cheese and cooked whole-grain spelt. I blended herbs, yogurt and lemon with the cheese. 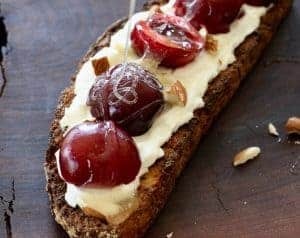 The salty cheese and sweet cherries made a delicious combo. 😉 The spelt adds chewy texture plus fiber. Feel free to substitute a grain you may have on hand. Cooked grains can be frozen in an air-tight container, making them versatile for quick add ins such as this salad. Many LiveBest recipes include fiber-rich foods. Most of us don’t eat enough of ’em. Are you ready for your own fiber challenge? 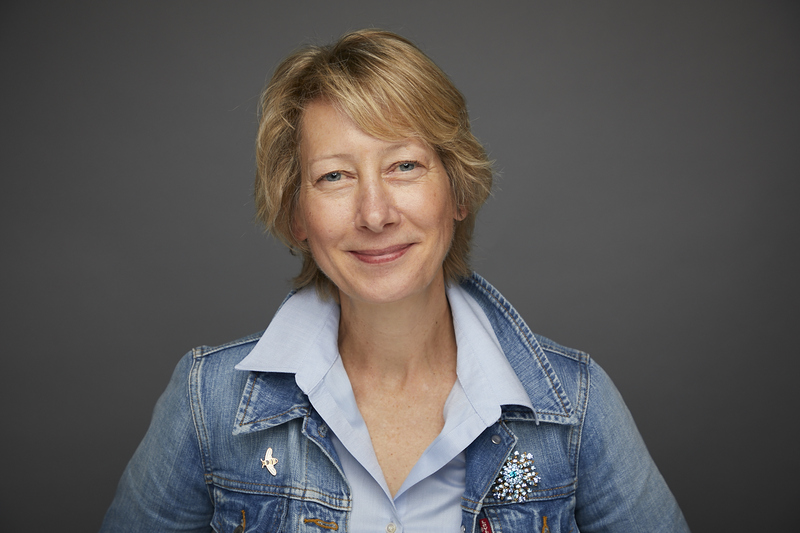 I created a free, 5-day challenge you can join by clicking this link. You’ll get tips and tools, resources and recipes to create your own roadmap to meet your fiber goals. Don’t ya? Won’t ya? Seriously, it’s only 5 days 😉 Find it right here. P.S. 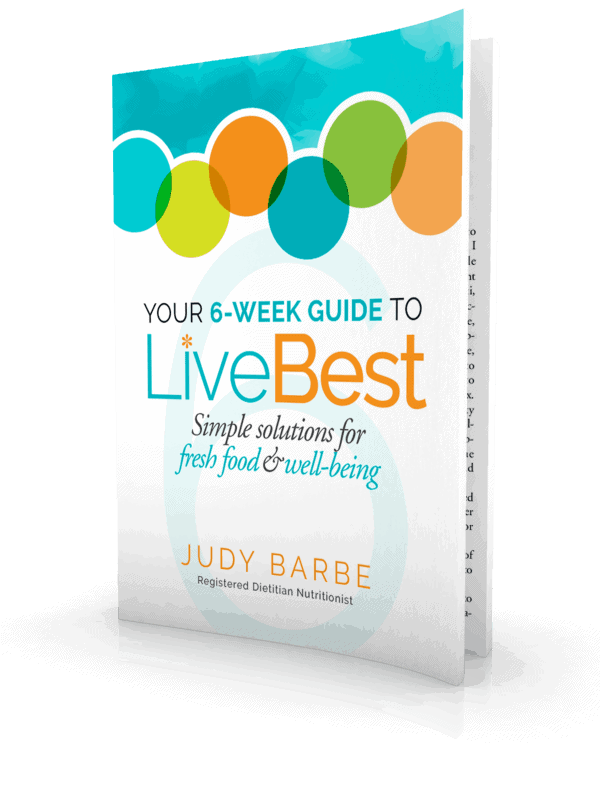 Want more healthy eating tips and recipes? Sign up for my newsletter right here. Cherry Herb Cheese Salad is summery goodness with fresh cherries and herbs and creamy goat cheese. Every bite is scrumptious and fresh in this easy to make salad! Herb Cheese Log: In a medium bowl stir together goat cheese, yogurt, herbs, lemon zest, salt and pepper. To make a cheese log, spoon mixture onto a 8-10-inch piece of saran wrap. Make a tube of the saran wrap: fold the edge of saran wrap closest to you over the cheese. Fold end farthest away from you toward you. Leave the ends open. Gently roll the cheese mixture back and forth over the counter to create a log (similar to making a rope with Play Doh). The cheese is soft but the goal is to make a log that is as similar in thickness as you can. Fold ends under. Place in refrigerator for 30-45 minutes to harden. 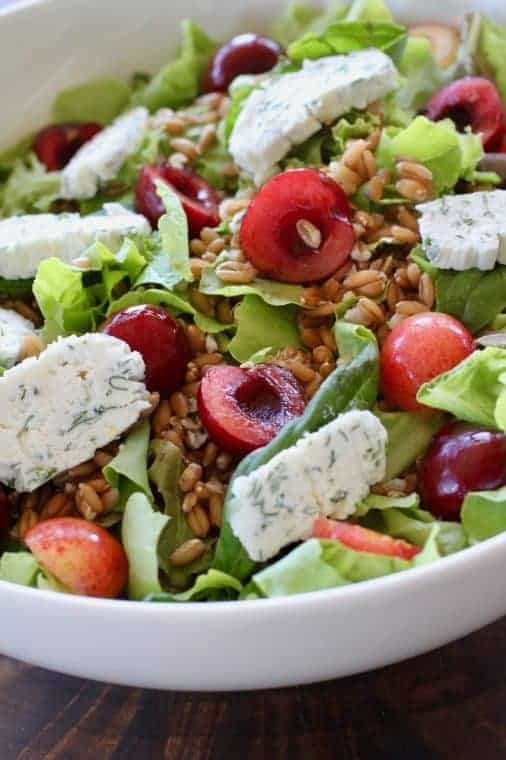 Salad: Combine lettuce, spelt, cherries and goat cheese rounds. Drizzle with you favorite vinaigrette. Or slice them on toast with plain yogurt or ricotta, chopped almonds and honey.